Tag line: "Flesh crawls! Blood curdles! Phibes lives!" One year after The Abominable Dr. Phibes, everyone’s favorite mad doctor returned in Dr. Phibes Rises Again, but instead of exacting revenge this time out, the good doctor travels halfway around the world in an effort to cheat death once and for all. Aided by his beautiful assistant Vulnavia (played by Valli Kemp), Phibes sets sail for Egypt, hoping that the country’s fabled River of Life will not only bring Victoria back from the dead, but also grant her (and himself as well) eternal life. Unfortunately for Phibes, he isn’t the only one seeking the River of Life; wealthy socialite Darrus Biederbeck (Robert Quarry) is also in need of its healing waters, and is trying to beat Phibes to the punch by finding the river first. Meanwhile, Scotland Yard’s Inspector Trout (Peter Jeffrey), doing his damnedest to track down the elusive Phibes, journeys to Egypt with his boss, Superintendent Waverley (John Cater), in the hopes of bringing the fugitive doctor to justice. For me, the most entertaining aspect of The Abominable Dr. Phibes was its creative kill scenes, with Phibes evoking the seven plagues of the bible to take out the men and women who let Victoria die on the operating table. Not to be outdone. Dr. Phibes Rises Again also has its share of inventive murders; hoping to retrieve an ancient papyrus that Biederbeck had stolen from him, Phibes and Vuivania, with the help of a couple of snakes (and a neat little gizmo), quickly polish off Biederbeck’s valet (Milton Ried). The real fun begins, though, when the action shifts to Egypt, where several more people working for Biederbeck meet an unusual end (we’re given a hint what’s going to happen to one of them when we spot the doomed employee reading a copy of Henry James’ The Turn of the Screw). While the kill scenes, coupled with some elaborate set pieces (the best of which is Phibes’ Egyptian lair) and a few inspired comedy bits featuring the bumbling duo of Trout and Waverley, make Dr. Phibes Rises Again a memorable experience, it’s Vincent Price who makes it a fun one. 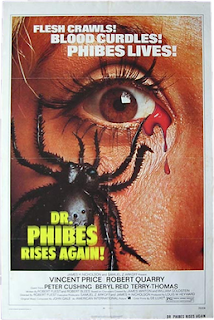 Right from the get-go, it’s obvious Price is having the time of his life (as with the first film, Phibes is unable to talk, meaning all of the character’s dialogue had to be recorded off-set), and his exuberance spills off the screen, making Dr. Phibes Rises Again a worthy follow-up to its very enjoyable predecessor.